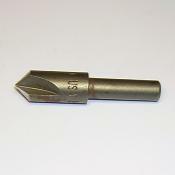 3/8" x 82* three flute countersink. Perfect for making 4-40 to 8-32 standard countersunk holes. Countersink has a 1/4" shaft and is made of high speed steel.